Two different people made the same post on my facebook page, just days apart from each other and without knowing the other had done it! This has never happened to me before in this specific way and so close together, I was laughing a good bit about it. I guess I am just that predictable! 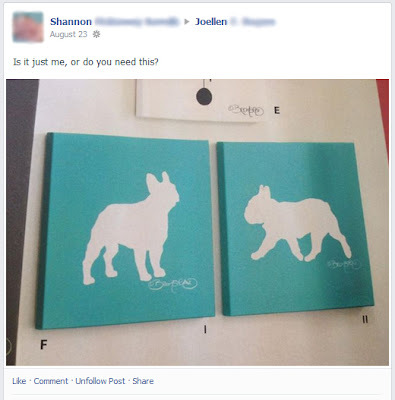 It is aqua french bulldog art, and they are right, I DO love them! But what is not to love? 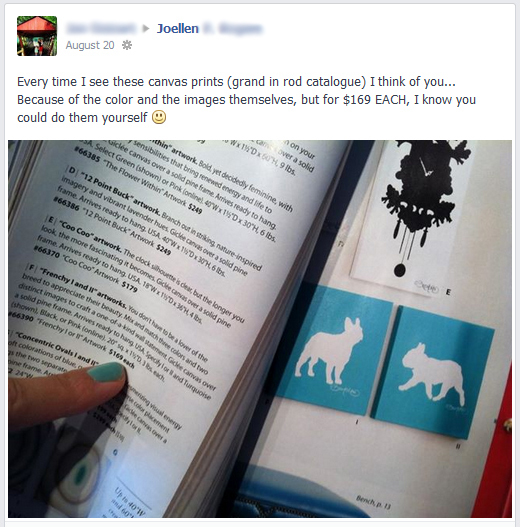 Maybe the price tag... my friend is pointing out that in the bottom pic the price is listed as $169 EACH... for a print! Come on, I am no artist but even I could buy a french bulldog vinyl decal ($5), stick it on a canvas ($10), brush my favorite color all over it ($2), peel off the vinyl, and voila! You just saved $150! :) Now, if they were the original works actually signed by David Bromstad, then that may be a different story.